Al Sondos Suites by Le Meridien Dubai - Dubai Hotel Located in Dubai City Centre, Dubai Shopping Area and Dubai Business District! 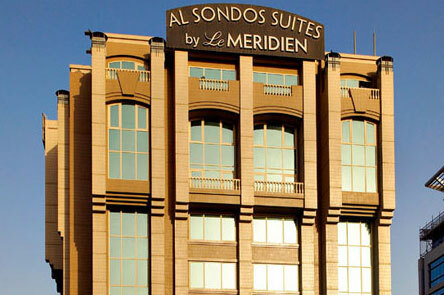 The Al Sondos Suites by Le Méridien is located in the centre of Dubai. The suites are steps away from the Deira City Center and the commercial district of the city. Each spacious suite has large windows, elegant furnishings and a flat-screen TV. There is also a seating area and a kitchenette. Al Sondos is 3 km from Gold Souk and a 17-minute ride from the Dubai Creek Golf course. Among the many great facilities at the hotel you will find a rooftop swimming pool with a sun-lounger terrace. There is also a sauna and a fitness centre. Guests can enjoy International cuisine at the News Café. Arabic specialties and shisha are available at Al Mabsam. The hotel is 4 km from the Dubai International Airport.